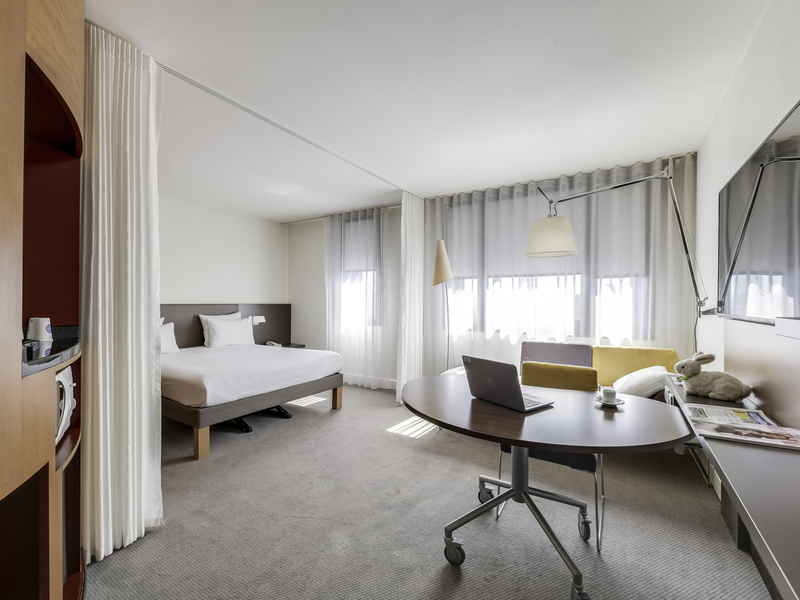 Let yourself be tempted by the inviting atmosphere of the Novotel Suites Paris Nord 18! You can look forward to a warm welcome from the entire team and a stay in our modern, spacious suites. Novotel Suites Paris Nord Hotel, Paris 18th arr., is accessible from Roissy CDG Airport by RER B and SNCF train stations: Gare de l'est & du Nord; by car from ring road and A1. 200 meters from the hotel the metro 12 Porte de la Chapelle station (exit on the odd-numbered side of the street) provides direct access to the monuments of Paris. In less than 10 minutes you can be at the Stade de France for concerts and sports events. I also wrote this on Tripadvisor. So disappointed this is an Accor hotel. It should never be recommended: UNSAFE LOCATION - Once locked inside the hotel, the rooms and staff were fine. Getting to the hotel is a safety hazard. Following the text instructions from the hotel to use the local metro stop and walk to the hotel, my family of 4 had to walk through 2 refugee camps at 10pm. We were too far into the bad area to turn around safely with various people following us. When booking the hotel, I did not realize Paris police consider this area a NO GO area for women let alone families. If you read this and still stay at this hotel, it's on you. This is clearly a DO NOT STAY location. Hi I satisfied with service food and room but not the place of the hotel. Around of hotel there are a lot of junkies and homeless people which make my family difficult to go in and out from hotel. UNSAFE LOCATION - Once locked inside the hotel, the rooms and staff were fine. Getting to the hotel is a safety hazard. Following the text instructions from the hotel to use the local metro stop and walk to the hotel, my family of 4 had to walk through 2 refugee camps at 10pm. We were too far into the bad area to turn around safely with various people following us. When booking the hotel, I did not realize Paris police consider this area a NO GO area for women let alone families. If you read this and still stay at this hotel, it's on you. This is clearly a DO NOT STAY location. Located in the 18th arrodissement. Hundreds of homeless camping across the street (under the bridge) that makes you feel unsafe. Besides, Staff very helpful, excellent breakfast and very clean. Good Hotel with quite nice setup but the area around it is not nice at all. Great staff. Professionnal and helpful. Spacious rooms. Perfect internet connection. Well i enjoyed my stay with my kids. Booked superior suit for 2 adults and a child, everything was okay for the first 4 days, then one day I went down to reception to say my card wasnt working, the man was on the phone but still dealt with my query, asked for my room number, swiped card and gave it back to me, then a minute later he calls me and says &quot;Its not your room&quot;, while still on the phone with someone else, I answered back saying that it is my room, I called my room number 2 more times but he just kept saying &quot;its not your room&quot;. I felt so embarrassed, took out my drivers licence and showed it to him, he then nodded and gave my licence back while still on the phone with someone.. no sorry, no nothing. Then next morning I went down to reception to ask about invoice that I got on email, everything was explained and then woman says &quot;you know you are not staying here tonight, right?&quot; And I had no clue what she was talking about, she then said &quot;there was a bomb found near here, and hotel will be closed for tonight, my colleague was meant to inform you&quot;.. but apparently colleague forgot to inform us.. nice! We were told to go to Novotel Est, went there, got our cards for the room, went up to the room and found that tiny room, that was literary 3 square meters, one tiny window, no microwave, no coffee machine, no bath, no place to move. We went down to reception and I asked if there was a bigger room because I paid for 6 nights in a big superior room with all the kitchen appliances etc, I was told I need to pay extra if I wanted to move to a bigger room.. well I think its a nonsense! Then when we were at the bar, I ordered cheese board for one which was 8.50, and drinks for me and husband, at the end when we were paying a bill I noticed that we were charged 15 for the cheese board, but only noticed after I paid and my husband asked me not to say anything because there was no point after our experience with reception staff earlier that morning.. so overall I can stay that Novotel suits have very good rooms, cleaning staff were very good also, but staff at reception was rude and unprofessional. Novotel Est.. well no words to explain how our last day of Valentine's trip to Paris was ruined.. worst place we ever been to considering we are travelling around Europe a lot. Service was of of very poor quality. The staff did not speak English. We were relocated to another hotel for a part of our stay and informed of the fact one day before in the evening, by email. No one responded to my email regarding this fact. What is more, the hotel is located in a terrible neighborhood, surrounded by homeless people, some of them hostile. I’d never recommend this hotel to anyone. Positives: Clean & big room, Friendly & helpful staff, amazing breakfast Negatives: Poor performance of Air Conditioning system Area outside the hotel with refugees living in hundreds in tents. Never felt safe while going out or coming in the hotel. This is a factor that has convinced me not be in this hotel from now on ever. Hotel was ok, location was not. My kids and I had to change rooms due to noise. Also they are 6 and 12 and we're harassed by the camp of homeless people set up under the bridge across the street. Made things uncomfortable. Nice and excellent hotel. The room is clean and nice people. It has kitchen in it, shower and bath are very good. Nearby to the center of Paris. Price-quality is very good. Conveniently located hotel, good bed. Spacious suite. Heater/aircon of the room did not work well, it was not possible to cool the room. It’s a pity that so many disposable items are used for breakfast. This does not match the advertisements In the elevators that so many trees are saved. We love Novotel Suites. It is so kid friendly and with two young children it works really well. Staff were very kind. The Hotel and staff were great. The hotel itself is in a terrible area surrounded by refugees living in tents. The approach to the hotel is very intimidating especially when travelling with a young family. I have been given wonderful customer service experience by Mr. Miguel Thomar. He has helped me to change my booking with ease. I have used Novotel many times in past and I would recommend it for the future too. only surrounding areas have issues of refugees and nuisance if hotel sorts out that Hotel would provide a pleasant experience to everyone.